This Traditional Juvenile Microfiber Recliner is designed to give your child a cozy spot to read, play video games, watch TV and relax. It comes in multiple attractive colors and a traditional button-back design that would work with a wide variety of decors. 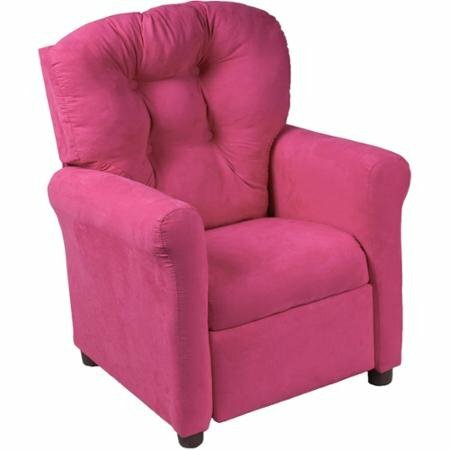 This kids' microfiber recliner features a smooth and sleek polyester cover that can be easily spot cleaned as needed. It is made with polyurethane foam and a polyester fiber filling for enhanced comfort. This juvenile recliner also has padded armrests and can be set into a lounging position with its flip footrest. It is constructed out of solid wood and sturdy metal for extra durability. This Traditional Juvenile Microfiber Recliner can support up to 78 lbs of weight. It is recommended for children from 3-11 years of age and would make a great addition to a playroom, family room or child's bedroom.